Key Difference: Left and right Politics define two different outlook of politics based on completely different ideologies. Left wing supports strong government in order to control economy and to bring substantial equality. On the other hand, right wing supports rule of the entity which is capable enough in terms of knowledge and experience. It does not support much interference from government unless required and believes in bringing formal equality. Left and right wing or left and right, basically are used to define two different ideologies of political spectrum. The term left and right got established during the French Revolution. It originally referred to the seating arrangement in parliament, where conservatives sat to the right of the speaker and radicals to the left. Left wing is also known as liberal or progressive in nature. It can be considered to be very closely related to socialism as it believes that government should take care of all its citizens. They also believe in bringing substantial equality. Left wing politics is more interest in bringing social justice and reforms. It aims to create a society with equal opportunities. 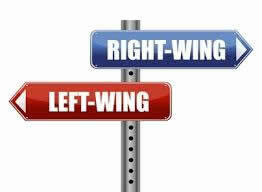 Right Wing is considered to be of the opposite polarity in comparison to left wing. It is also known as conservative or regressive in nature. Right wingers do not support the notion of left wingers that government should interfere with lives of people. This wing believes that government is too big and should not interfere in the lives of people. They also believe in bringing formal equality rather than substantial equality like left wingers. This kind of politics focuses on maintaining order and also maintaining privilege. It provides protection to private property and in a way it supports capitalism. It is important to mention that few traits may differ in the definitions of both from country to country. However, main core ideologies remain the same. Left supports change in order to improve conditions of the people, whereas right wing supports traditions and supports changes but with great caution. Left wing supports the notion of a big role of government, whereas right wing feels that the role should be small. Unlike Left wing, right supports less government ownership. Left and right, both wings believe that law and order needs to be maintained and are important. However, left thinks that it is important for protection of right of citizens, whereas right believes that it is necessary for protecting society and its tradition. Left prefer to rehabilitate criminals, whereas right consider that criminals need to be punished. A small role in people’s life. Wars are natural phenomenon and it becomes necessary many times. When I think about left politics, I only think about dictators shutting up people who are not within an allowed range of opinions. I think about stealing money from productive people to give some back to the poor and keep as much as possible for the functionaries... I think about hate-speech acts, gulags and piles of dead intellectuals. How does that go with the table above? Am I so badly informed?